Hello ( by the way, Joy picked the title, as she spent her weekend cleaning green marker off her white wall 😂). I’m sure your toddlers and young kids have resumed their third term of school in Nigeria. There will be new challenges coming up for them during this term and one of the things they will be teaching them is Writing. Now please, do yourself a favour: encourage your child to write and make marks. Don’t force or expect your child to make legible marks (like alphabets or numbers) if they are below the age of 4/5. Try to encourage letting Writing be as something fun to do. The most important thing to teach is the Pincer Grip (putting your thumb, index and middle fingers together to pinch an object). Even if your child is a Leftie (left-handed), please don’t let them change him (schools in Nigeria like to “correct” lefties, which is wrong). Simply encourage the child by pushing the slate or paper or box to the top left of the desk, away from their body. Right-handers people write away from their bodies, left-handed people write towards their bodies, their bodies get in the way so slide that paper away from their bodies to the top left corner of the desk. And children don’t really show a dominant hand till maybe 3 to 5 so don’t stress if they still use both hands to scribble. There are a ton of good brands (always go for Non-Toxic, like Reeves or Crayola etc) out there so all I will say is, avoid those really cheap N200 crayons as they are awful and don’t release colours smoothly and are hard to use. Also look at triangular-shaped crayons (Melissa & Doug is the brand I see a lot in Lagos supermarkets. 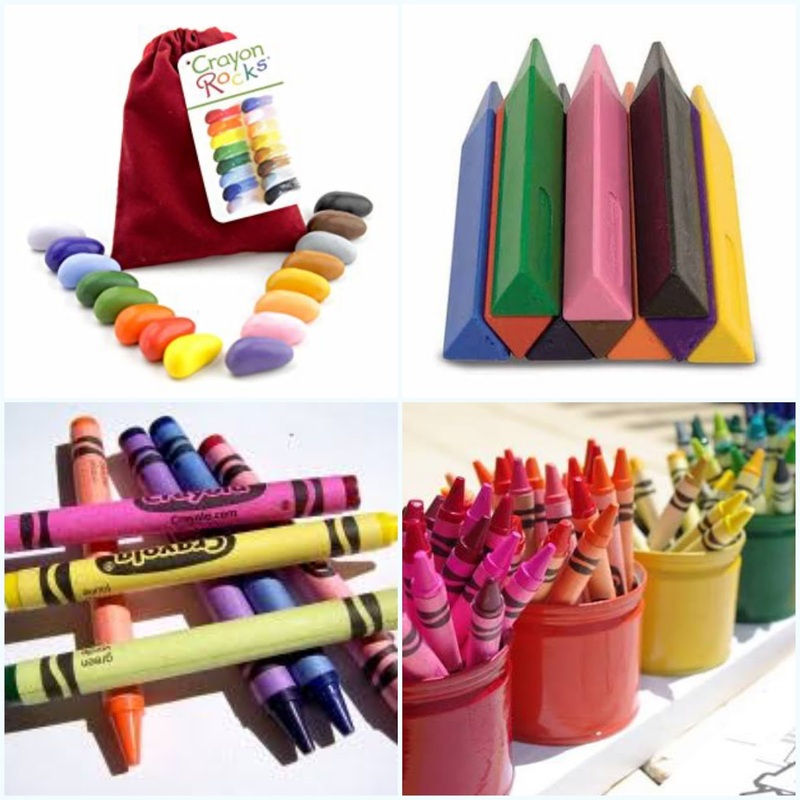 A lot of American Montessori and Waldorf schools use crayon rocks. Here’s a great tip: arrange the crayons in matching coloured containers, to help teach Colours better. We used our Stacking Cups for this. An oldie but goodie! I love the vintage look of children writing with a slate. A slate (chalkboard) and some coloured chalks are very encouraging to kids. Endless possibilities! It’s also one of the more affordable options out there. Get a small-sized one that can sit on their laps with comfort. 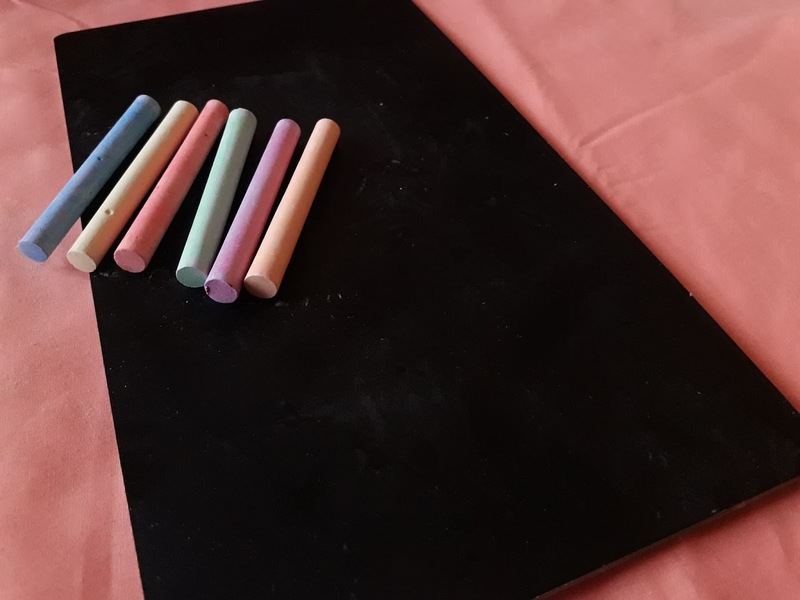 Even better, DIY it: Crafties, in Ikeja, sells chalkboard paints so any piece of smooth wood becomes a slate. Love, love this method! 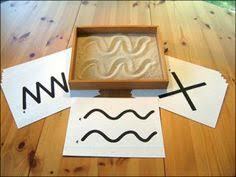 It’s so easy and Montessori encourages the use of natural objects. And it is the most affordable way to practise writing. All you need is a wooden box (no lid) or even a tray (a deep one). Pour some sand in it (I recommend play sand, sold in most supermarkets and art stores in Lagos, Abuja, etc) or beach sand. Beach sand is fine to the touch and relatively cleaner than construction sand (but you can always sift it). Just a little will do. Print some flashcards of giant letters for your child to copy and you’re done. Please use washable Markers (or you too will be repainting white walls yellow, to discourage your creative toddler from decorating your wall with a green marker). 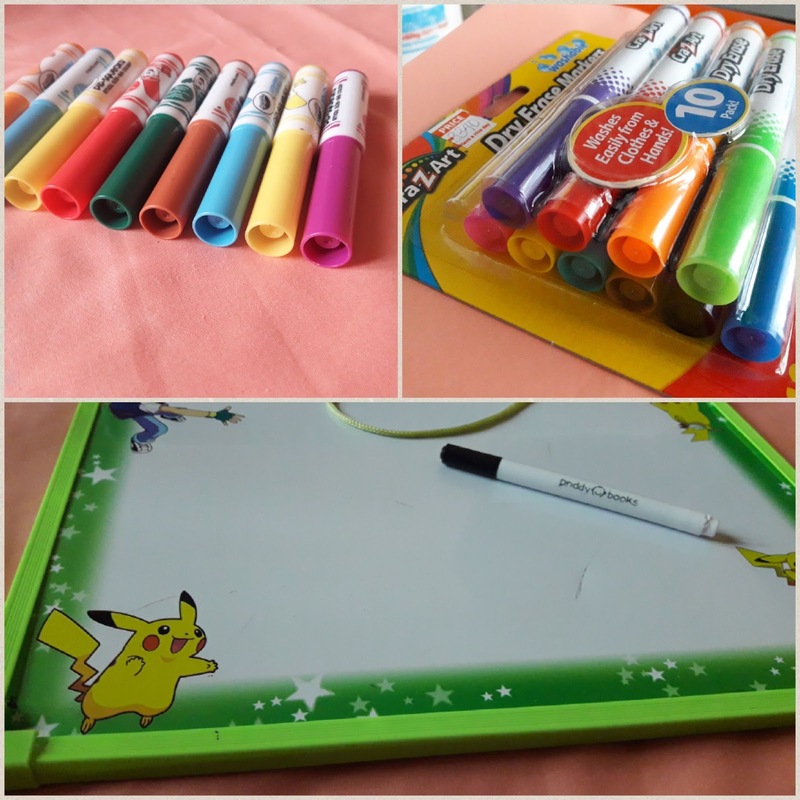 You can get the board pretty much anywhere and I believe AB Artworld has a sweet deal on washable markers (which are not very common), they’ve got branches nationwide too. My only issue with this method is, those magnetic boards do fall apart and markers do dry out eventually. But they are nice. 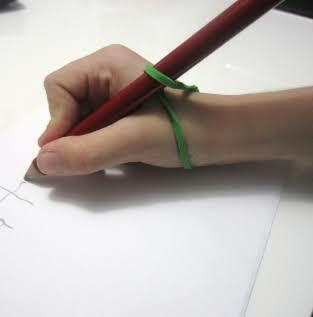 If your child is older and already using a pencil but struggling a bit, try using a hair band to attach the pencil to their hand, like below. And if your child is a left-hander, put the paper on their left and encourage them to not hold the pencil at the point touching the paper, but move it higher (about 1″ higher), so they can see what they’re writing. Also, they should use their right hand to stabilise themselves (and right-handers should do vice-versa). So that’s it! I hope this was helpful. If you have any questions, please feel free to comment, we’ll answer them and don’t forget to share this with your friends. Have a great week ahead, stay blessed. Should your son play with a doll? Great read and I support all you have said. I still don't get why schools termed as a learning place is basically now a place where the proprietor is trying to keep up with the Jones's. We have seen Nursery schools award grade positions to 3 year-olds and it's appalling. As to your concerns about finding a good school with structured play, there are a few we have seen. But the proprietors always say "Nigerian parents want grades and competition". Which is quite sad. All the best in your search, we've seen one or two schools around Lekki-Ajah axis that I feel are good at structured play. Don't stop searching for the best for your child and we have several posts planned for explaining Structured Play so parents can do it themselves. Thanks.